To get to the schoolhouse, they had to cross the creek that ran through the Lowery farm. As Myrtle remembered it: “At the bottom of the hill was a big crick. When it rained a lot, the crick would get up and we’d have to walk across on a foot log. You see, they put a tree across the crick and then they put a thing along to hold to, and you would walk across on that, and the water just a rolling down below, just roaring. It’s a wonder we hadn’t fallen down in it. Sometimes my dad would bring a horse down for us to ride across.” Shared memories like that foster life-long friendships. Lizzie Alexander grew up and married Rex Sutton, a Tunnel Hill boy, in 1923. He had been raised by his grandparents William and Rhoda Webb Sutton. Sometime during the Depression, like many other people from southern Illinois, they moved north to get work. It was logical that they would move to Aurora where they had several friends, including Jim and Myrtle Greer. Rex found work on the assembly line at Barber-Greene, a company that manufactured heavy machinery. In their later years Rex and Lizzie lived in a small house on Walnut Avenue. They did not have children. 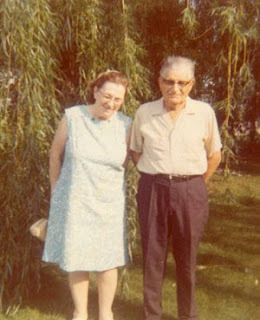 In this photo, Lizzie and Rex Sutton are standing by Myrtle’s weeping willow tree in the front yard. The occasion is Jim and Myrtle’s 50th wedding anniversary, July 1966. 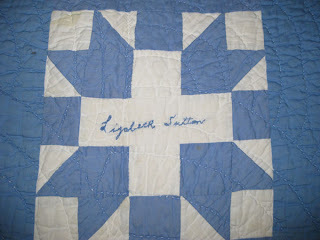 Although she was always known by her nickname, Lizzie signed "Lizabeth Sutton" on the quilt. This leaves us to wonder if her name was really "Elizabeth A." as shown on the census and other records, or this shortened, friendlier form. P.S. To set the record straight, I don’t use the quilt on my bed as pictured in the previous post. I store this treasure as carefully as a person can store a quilt in a home. My mother gave it to me in August 2006. I actually seem to remember the tree...does that seem right? I wish I had more clear memories of Grandma and Grandpa Greer.